‘In this narrow world are one town, one pit and many people: all in a strip of land roughly a mile wide and three miles long, a land with a dark as well as light side. 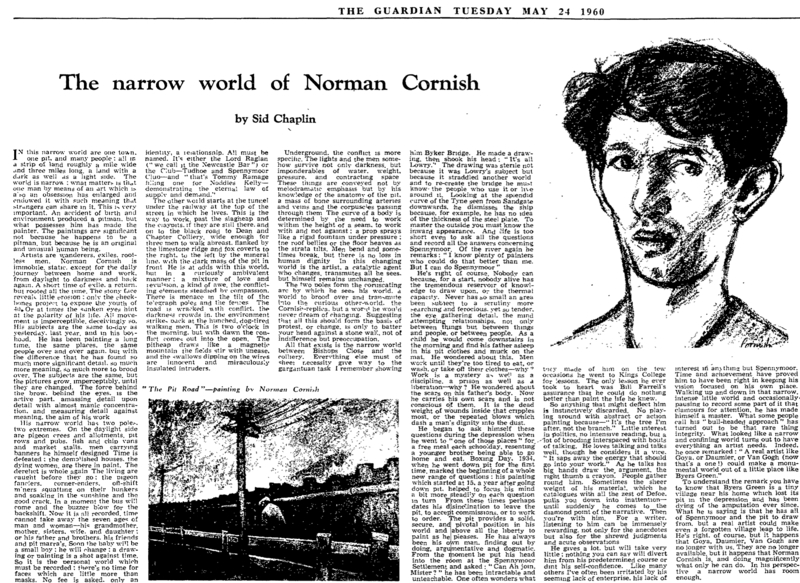 The world is narrow: what matters is that one man by means of art which is also an obsession has enlarged and endowed it with such meaning that strangers can share in it’, wrote Sid Chaplin of the work of painter Norman Cornish, an ex-miner who made the small town of Spennymoor, County Durham and its inhabitants his principal material. Cornish’s work in abstract focuses on the relationship between the individual and society, yet, in terms of immediate content, attention is nearly always placed on the infinitesimal: we see repeatedly and without refrain the working men of Spennymoor, the landscape of the town and its collieries, and all the things in between. Like many of the poverty-stricken young men of North East England, Cornish was denied a further education and thrust into the world of work during adolescence. It was the colliery that became his initial fate at the age of 14 in 1933, the ‘death warrant’ which would usually dictate a lifetime of hard-work underground. A sense of community would repair some of the damage done, as would the many hours spent in the club amongst the bar-flies, but change was never usually an option. A sensibility awoken by the horrors of the pit and a dogged interest in the lives of his fellow workers, concentrated his eye on the people he knew intimately, and of whom he could find the devotion to paint. One year after first entering the pit, Cornish picked up his paintbrush, a tool cherished until his death. He died at the great age of 94 in August, 2014. It was in 1966, when Cornish emerged, withered and damaged by years of back-breaking labour, out of the mineshaft for the final time. He had been quietly building a small reputation and with assistance from the sympathetic galleries and educational institutions of Newcastle-upon-Tyne he would soon discover his paintings among the belongings of the rich and powerful. * His dedicated wife had convinced this initially reluctant artist to abandon the job that had given him his subject matter and numerous back problems in order to focus on his art full time. While painting had always been ‘an itch that you have to scratch’, it had never been his sole occupation. Retirement gave him the freedom to paint and carry on his meticulous observations of Spennymoor. He would continue to do so for nearly 50 years. He is right to argue that his work should be seen on its own terms, without the baggage and associations of ‘Pitman Painter’, and yet we can understand why the art establishment has decided to lump him together with the other working class artists of the region. The decision to focus solely on Spennymoor and its people was an inherently political act. Cornish’s work has emerged not from the prestigious art schools and academies of the major cities but through the sheer determination of a man fighting the current. The odds of recognition or success were not in his favour. His work, however, seems to me to be of profound interest, with a legacy cast down into the work of artists of the current scene such as Alexander Millar. How can we reconcile the careers of Norman Cornish and Alexander Millar, two painters that have returned to the working men of North East England again and again in their work? In a recent blog post on the paintings of Alexander Millar, I wrote that the ‘appeal of Millar’s work is towards the sentimental, nostalgic and romantic modes. It is towards the belief that things were better in the past, that we have today lost something which once brought us together.’ The Gadgie, the romanticised working man clad in flat cap and creased suit jacket, is often the central figure of Millar’s paintings. He is nearly always drawn with his back to the artist, rendered anonymous within the industrial spaces of Tyneside in which he finds himself. He functions as a symbol of what has been lost, a lingering presence of a forgotten age, a memory resurrected from the great waves of history. The Gadgie reminds us of how things have changed in such a short space of time. And he seems to hold the current dreams of the region on his shoulders: a return to prosperity, hard work in the manufacturing industries and, possibly, traditional ways of living. A comparison between the two artists shows just how much Millar’s Gadgie is indebted the characters and landscapes of Cornish. The first image below is entitled ‘Pit Road with Telegraph Pole and Lights’ and is by Norman Cornish. The second image is by Alexander Millar and depicts his Gadgie walking through the streets of Tyneside. In both images, a working man wearing a flat cap, suit jacket and carrying a knapsack, is hunched over and on his way home from possibly a back-breaking shift within the industrial spaces of the North East. Turned away from the artist, he seems to stand in for the great mass of men who once lived and worked within places such as Tyneside and County Durham. These figures are oblivious to the romanticised and expressive environment in which they find themselves and instead choose to concentrate solely on the path which leads home. There is a temptation to view the former as a socio-historical document and the latter as nostalgic imitation. But aren’t both from the vantage point of the 21st century equally nostalgic works? The function of the pub within community life is alluded to within ‘Three Beers’ by Cornish and ‘Dominoes Night’ by Millar. The former takes on the subject of loneliness with the figure of the anonymous working man propped up at the bar drinking alone, while the latter functions more as a celebration of nights spent in the company of friends at the public house. Within Cornish’s painting there is the admission that life in Spennymoor has its difficulties outside the world of work, and that community is not always readily available to repair the worker’s psyche. Instead of retreating to his home, which may provoke additional worries, this worker relies on alcohol to assuage his sadness. This somber tone contrasts profoundly with Millar’s celebratory depiction of the pub. In ‘Dominoes Night’, the two gadgies are united arm in arm, swaying side to side, ready for the night’s events to unfold. Again we may set up the proposition that the sadness of the first scene equals realism while Millar’s celebratory nostalgia is viewed as merely a sentimental, romanticised memory of the ‘good old days’. ‘Pit Gantry Steps’ by Cornish and by ‘Launch Day’ by Millar show how the two artists approach the workplace. Within Cornish’s painting, the colliery steps rise up like a great monster beckoning the workers into the pit. The dots of colour and impressionist brush strokes recall paintings such as ‘Impression Sunrise’ by Claude Monet and this perhaps places the work in a tradition of high art which stretches back centuries. Does Millar’s ‘Launch Day’ seem cartoonish in comparison? Or can we perceive an unusual seriousness in this work, non existent in the paintings included above? Is Millar here reflecting on the intensity of emotion felt by the shipyard workers, the concomitant celebration and sadness of a job completed? Cornish and Millar seem to me to function as two distinct painters, rather than two in a tradition. The former strives for seriousness and realism, the latter, nostalgia. Millar knows that his paintings are not high art and rarely does he attempt to suggest otherwise. His Gadgie is a figure of fun, a one-dimensional totem that has never really existed. In my earlier piece, I wrote that Millar’s oeuvre ‘performs a purpose, to satisfy a deep yearning for what has been lost, to reintroduce us to a collective, imagined history. This is exactly why we are drawn to his work.’ And this today seems to true despite the obvious falsity of his characters and landscapes. Cornish, on the other hand, strength lies in his observation of the realities of daily life in Spennymoor. While it is Cornish who will surely be remembered by history, perhaps it is Millar, however, that speaks more profoundly to current North Eastern desires. * There is speculation that Tory Prime Minister Edward Heath hung two of Cornish’s paintings on the walls of 10 Downing Street during his incumbency. This is said to have provoked ‘wry amusement to the artist with his staunch socialist background’.